​Your dog deserves the freedom and joy of a nice yard to play in with an unobstructed view of what's going on around your home. Unlike traditional fencing systems that reduce your visibility and require costly maintenance and upkeep, our dog fence system is maintenance-free, saving you time AND money. "Runners" and "jumpers" can be seriously injured by traditional fencing, and leashes can also entangle and harm your pet while limiting their freedom of movement. Our hidden fence system will safely "keep your hound around" and out of trouble! 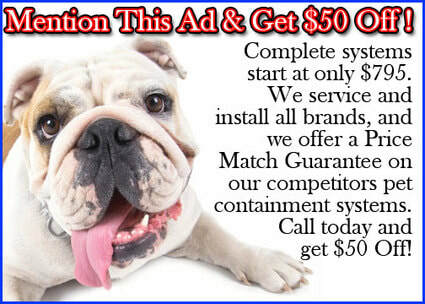 Keeping Pets and Pet Owners Happy for More Than 15 Years! Call or Text Us Today for Your FREE Quote. ​Installation of your Hidden Fence System can be done in about 2-4 hours and leaves virtually no visible trace of fencing wire except for the training flags used to give your pet a visual reminder of where "not to go." Your Hidden Fence System will work with you and your pet during the most crucial stages of training, to make sure to meet the needs of you and your pet, and that your pet's training is progressing effectively. ​After approximately 2 weeks of training, you and your pet can begin enjoying the benefits of the industry's safest & most effective Hidden Fence System. ​©2018 A Hidden Fence. All images appearing in the A Hidden Fence web site are the exclusive property of A Hidden Fence and are protected under the United States and International Copyright laws. The images may not be reproduced, copied, transmitted or manipulated without the written permission of A Hidden Fence. Use of any image as the basis for another photographic concept or illustration (digital, artist rendering or alike) is a violation of the United States and International Copyright laws. All images and Website are copyright protected ©2018 A Hidden Fence. Website Created By jtmccabe.com ©2018, All Rights Reserved.